Is LG ready to take on the smartphone heavyweights? It wasn't exactly a secret that LG would launch its Optimus-less LG G2 today - so were there any surprises in store? LG's new G2 looks like a Samsung Galaxy S4 clone. Its stand-out feature, at least according to LG's presentation, is the G2's backside. There was a lengthy discussion about placing the power and volume buttons—the only physical buttons on the phone--on the back of the G2. 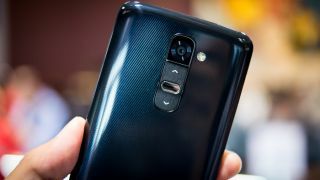 The design was apparently the result of LG's ability to listen to customers and users, though putting all the buttons on the back, right underneath the camera, seems a little awkward to use. The G2 seems like a nice phone with a good battery and decent design, but nothing jumps out at me. Why would I buy the G2 over the Galaxy S4, HTC One or the Moto X? I'd love to see an LG flagship phone that really catches the mood. You have to applaud LG for trying to do something interesting with the buttons although I'm not convinced it 'shifts the paradigm in smartphone design' as LG suggests. That said - the specs look great; two gigs of RAM, a meaty processor and a chunk of audiophile tech shoved in to boot. I just hope LG can get people excited about this. You may not think it fair of me to base my entire reaction on one (relatively minor-in-the-grand-scheme-of-life) feature but look: when Apple moved the headphone jack to the bottom of the iPhone 5, it really upset me. It's a stupid place for a headphone jack and it annoys me every single time I use my phone with headphones on - and reader, that is a lot. So I'm worried about this buttons-on-the-back nonsense. The LG G2 could be the best phone in the world but if this regularly-used bit of hardware is annoying, I'm never going to like using the thing. I'm actually really pleased with what LG is offering in the G2, especially in terms of that lovely big screen. Although the big song and dance it's making about putting the volume and power buttons on the back might seem a tad OTT, it's undoubtedly a great way of going big without compromising on functionality. Features like Answer Me also show similar thinking. Shame about not getting Android 4.3 but this is a minor gripe in what seems like an otherwise respectable, nicely spec-d handset. I must say that having a big button thing on the back is a terrific gimmick. It's no more than a gimmick – although it makes a little sense in terms of where you have your hand - but at least LG has tried to do something genuinely different, probably prompted by some board meeting in Seoul at which somebody slammed their fists on the table and said "we must do something different than Samsung". Shame then, that LG decided to launch this handset in an old music hall in New York. Which is precisely how Samsung launched the S4. LG has gone down the Samsung route of offering up a huge screen for those who like a whole lot of glass with their mobile phone. This isn't a bad thing, given the amount of media consumed on portable gadgets nowadays, and LG G2 certainly impresses with its 423 pixels-per-inch image density.